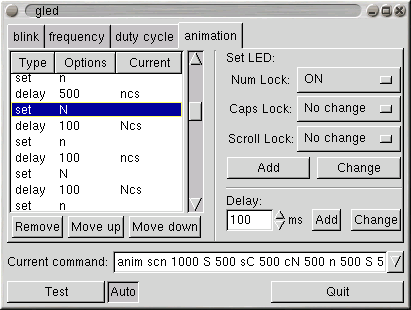 Ledcontrol is a program that allows you to show different information on the normally-unused LEDs on your keyboard. You can configure it to show virtually any true/false condition accessible or indicate an arbitrary number. The monitoring is by default done by shell scripts to allow for maximal configurability. Included are several useful scripts. Ledcontrol works both in X and on a text console. I have tested it only on Linux with a i386-architecture, but it may work also on other similar systems. Ledcontrol is distributed under the GNU General Public License. Ledcontrol is included in at least Debian (package names ledcontrol and ledcontrol-gtk), possibly also in other Linux distributions. Ledcontrol requires GLIB version 1.2.0 or higher (GLIB 2 may not work - untested). The GTK+ frontend requires at least GTK+ 1.2.0. You can contact me at sampo.niskanen@removethis.iki.fi. All feedback is appreciated. Ledsm is a light-weight monitor that can show the real-time CPU load or memory usage as a nice bar on the LEDs. morse2led flashes out morse code on the LEDs. This feature may be added to ledcontrol in the future, too. setleds, which comes with The Linux Console Tools (a standard component of most modern distribution), can be used to set / correct the LED states on a text console if wrong. VU Leds is an XMMS plugin allowing you to make the LEDs blink in pace with your music. Such a plugin might be made utilising ledcontrol, too. The LED museum, one of the greatest LED information repositories on the Net.